I’ve been asked to contribute to a compilation on Sonospace by Jeremy Hegge, who is curating the project. The brief was ‘field recordings that focus primarily on “nature” sounds, but the more unusual/hidden the sounds the better’. Jeremy used a recording of insects and lizards in dry grass I made several years ago at a campsite in Wales as an example. Originally the plan was to go down to the rocks at Sandsend at low tide at night to record limpets. To be able to capture the sound of these molluscs feeding, rasping away at the algae coated rocks with their radulas, would be amazing. However a lack of research, failing torch batteries and the difficulty of sticking contact mics to limpet shells scuppered the plan. All my fault of course, and to be out on the deserted rocks at midnight with a full moon beaming down and the gentle rhythmic waves of a calm sea was undeniably beautiful, even if nothing was recorded. Plan B was to go to go onto the moors on the off-chance of coming across something interesting. The sun was hot, the path was dry and crickets were chirping away in the heather. I was surprised to come across a small puddle absolutely full of tadpoles, minute water boatmen and tubifex worms. Obviously I placed a couple of hydrophones in it, and was quite astonished by the results. The sound generated by these tiny froglets vigorously swimming by thrashing their muscular tails was quite unexpected. The only other person I saw on that path was Charlotte, a teacher from a school in Wiltshire who was actually quite interested in what I was up to. She too was amazed by the sound of the tadpoles when she had a listen on the headphones. At the mercy of forces beyond their control, as their environment shrinks around them, with resources dwindling, becoming more isolated and starved of oxygen, the metaphors write themselves. I suspect that as the hot weather has continued, the puddle and all its inhabitants are now gone. As (I hope) it will be included in the forthcoming compilation I’m not going to post the actual recording here, but as soon as it is made available on Sonospace along with other fascinating hidden natures, I’ll let you know. When I was invited to work with Mark Browne on a piece for release on the Linear Obsessional label, I knew that the final outcome would need to be distinctive. Having purchased a second hand harmonium, Mark sent me a recording in which the physicality of having to keep the instrument’s bellows under sufficient pressure by constant pumping gave the work a respiratory quality. It breathed, and incidentally the previous owner was Lol Coxhill, who also made breath the tool of his trade. Held together by Duck Tape and wheezing with age, over forty minutes or so this harmonium clings to life long enough to produce a rising, incremental drone accumulating over time before a metallic release. A 38″ gong being vibrated by unknown means is a pressure cooker valve, bringing everything down to zero again. I went to work, drove the car, walked on the beach, went to the shops carrying this music with me. Making a contribution to someone else’s original thoughts is quite a responsibility. In the stereo system in my brain I played the music and tried to slot in something that would form a part of it. Something that was separate and yet genetically fused. 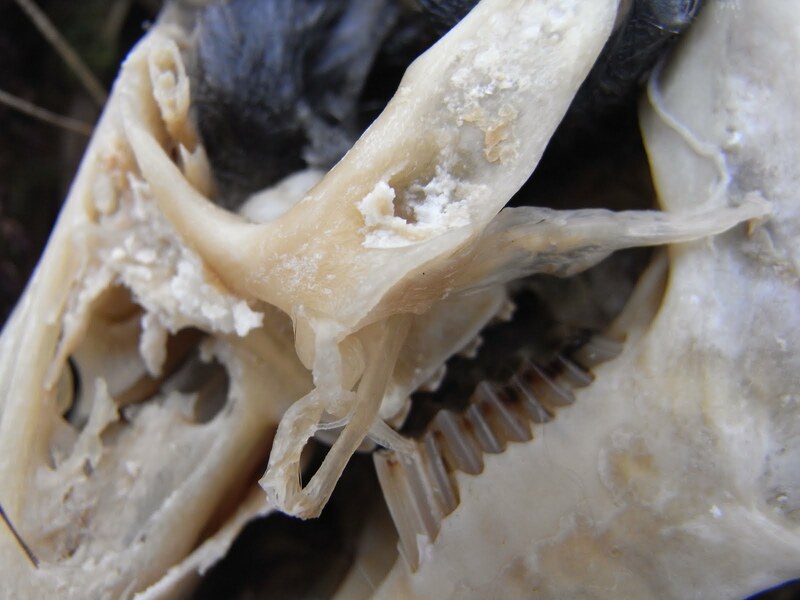 Something that lived inside it as a commensal rather than a parasite. Serendipity played a bigger role than art and I stumbled across some old recordings from the radio that if pitched just on the edge of comprehensible audibility might integrate nicely. That was the catalyst. Already memory was infused into the music and it did sing of those incredible television programmes and films of the past that drew deeply from the land and the folklore buried below its surface. Wholly British and wholly other. The loamy, rolling fields of the south, but also the scoured edges of northern cliffs seemed to be entwined somewhere in the harmonium’s exhalation. 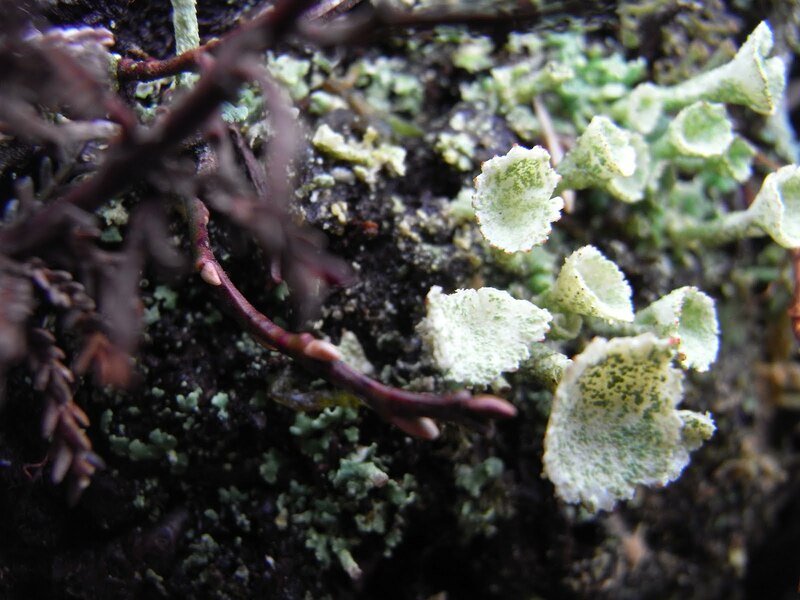 A History of Breath is available from the Linear Obsessional label as a beautifully designed limited edition CD with a link to an essay on memory and the land by Mark. It is also available as a pay-what-you-like download. Being invited to contribute to this compilation was a great honour as TQ covers those dark corners of music where the light rarely penetrates. Also with the quality of the other contributors, I knew I’d be in good company. For our interpretations there were three covers to choose from. I chose TQ 10 because it was concerned with objects, whereas the other two depicted locations in the form of maps. I had this idea to forensically dissect the cover, like an autopsy, to take the individual parts and reinvent them for the ears. I thought that if I could replicate those objects physically and the idea of the word ‘pendant’ could be realised, I might have the basis for a piece of music. On 22.01.18 at 1.30 pm I walked along the beach to Whitby and collected three stones and a piece of driftwood in order to fashion a pendant. I used two of the stones which looked rather like the ones in the TQ 10 cover illustration. I also used a holed stone given as a gift from Gavin Parry. It was presented to me at the time in a tin with two other items. I incorporated the lid of the tin too, so three stones and a tin lid were suspended from a piece of driftwood by golden thread. This pendant was gently agitated in various ways and the sounds were recorded. A week later, on a particularly windy night, I suspended a two stone version of the structure in a bush outside the house with contact mics attached to the threads on which the stones hung. These sounds of rattling and clanking, together with the strain and creak of the strings moving around on the driftwood created the basis for the track. A field recording of a place known as Three Howes, a line of three Bronze Age round cairns South of Grosmont, North Yorkshire, provided the ‘T’ element. The day of the recording was cold and frost was lingering still. Puddles had a thin crusting of ice and gunfire could be heard carried on the winter wind. A field recording of building work being carried out at The Quayside restaurant on Pier Road, Whitby provided the ‘Q’ element. I stood across the street and captured men’s voices, drilling, the moving of heavy objects and the ever present gulls. Every so often a tourist would pass by. The column of triangles up the side of the panel on the cover suggested a simple repeated pattern, so I took this as a graphic score for a synthesised sequence which starts about a third of the way through the piece. The curved shape I took to represent a softer, more sinuous element. A repeated melody entering the sequenced pattern at some point, less harsh and less defined. Maybe I overthought the whole thing, and maybe the choices and construction should have been left as a mystery? Maybe it would have been easier to just make a piece that represented an impressionistic view of the whole cover as a totality? Either way, as I said before, this was an attempt at a forensic autopsy of a graphic concept. I think I’ve been watching too much Nordic noir? So many thanks to Andy Wood and Chow Mwng, and of course all the contributors for making it what it is. Coastal Ghosts and Winter Beach Parties. I’ll be playing a gig in London on Sunday, December 3rd at The Art Cafe in Manor Park, Lewisham, London from 3pm onwards. It’s one of Linear Obsessional’s regular live showcases all thanks to the sterling efforts of Richard Sanderson. My bit will consist of field recordings ranging from the angry North Sea pounding the bitter winter coast to the intimate confines of rockpools, with their mysterious clicks, dribbles and scrapes. This will all be layered with the sounds of various found objects, both naturally occurring and man made, looped and vibrated and scratched. I’m travelling down on the train, so the amount of equipment used will be minimal, all fitting into one Stagg instrument case. Can’t wait to see the other turns on the bill: Kathy Hulme, Blanc Sceol (consisting of Hannah White and Stephen Shiell), Dave Clarkson with Ruth Davies on electric cello and of course Hither Green Improvisers’ Group. If you’re around, do pop in, although I’ve been informed that the cafe has a tin roof and can be a bit nippy, a tartan blanket with a flask of something hot is recommended. Luckily it’s a cafe, so thermos refills are available. Hell, there’s even been hushed mention of mulled wine! Up on Wheeldale Moor yesterday collecting sound for a forthcoming release on Serg Semperflorens’ label. I used the enigmatic Wade’s Causeway as a focal point, making the stones, plants, puddles, streams and birds the raw material for a composition. 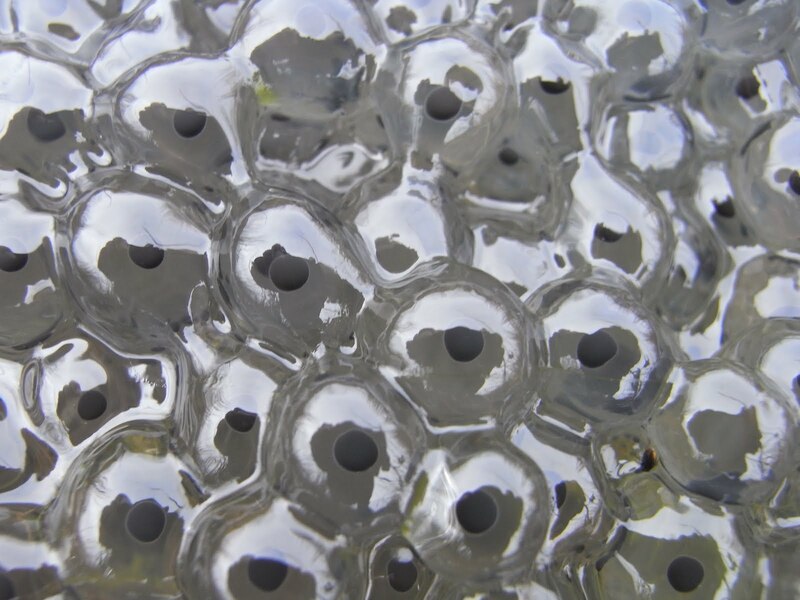 There was a lot of water up there, and the potential for new life was evident in the frog spawn which broke the surface of the pools in several places. There were also dead rabbits littering the grass and heather. Birth and death as ever in close proximity. The day was mild with a very gentle wind and I didn’t see another soul on the ancient road. Lapwings circled over Tranmire bogs and their calls were a constant backdrop, together with the distant rush of Wheeldale Beck as it skirted the woods. The road itself has traditionally been attributed to the Romans. The sign indicating access to the monument has a picture of a helmeted Roman centurion. 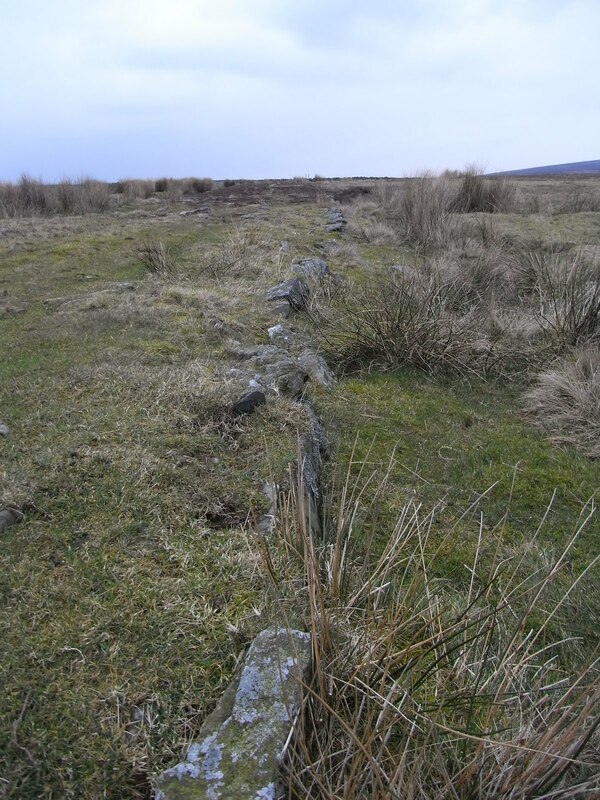 Recent work, however, has suggested that it could be medieval, or that it might not be a road at all, but a much modified Neolithic or early Bronze Age boundary feature. 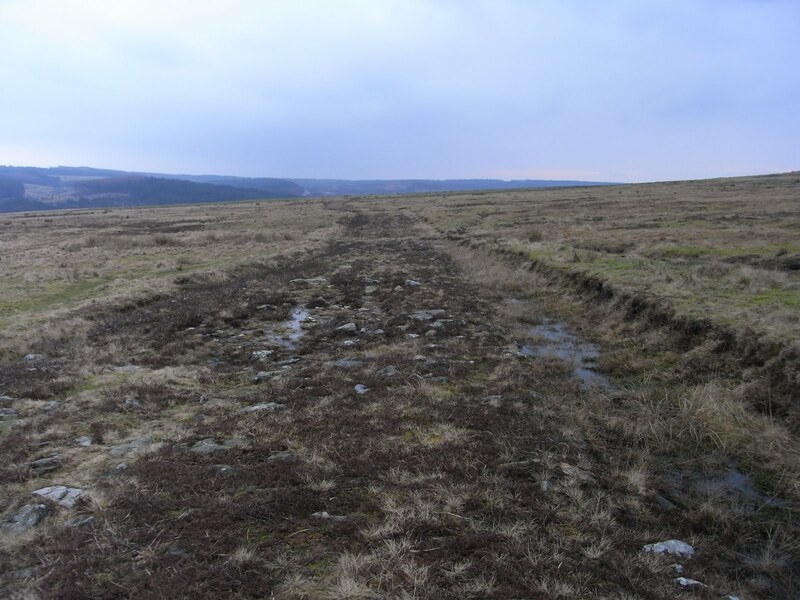 Around a mile of the road is visible on Wheeldale Moor. Wade’s Causeway, as the site is also known, derives from a local legend that the ‘road’ linked the home of a giant called Wade who lived at Mulgrave Castle near Whitby with that of his wife, Bel, who lived at Pickering Castle.